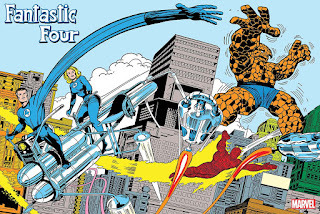 Cybertoon.com: 05.15.2018 - Celebrate the Return of the Fantastic Four with a Special Classic Kirby Poster! 05.15.2018 - Celebrate the Return of the Fantastic Four with a Special Classic Kirby Poster! Be sure to pick up FANTASTIC FOUR #1 (LGY #646) on August 8th, and stay tuned for announcements about FANTASTIC FOUR’s release, upcoming incentives, and more!